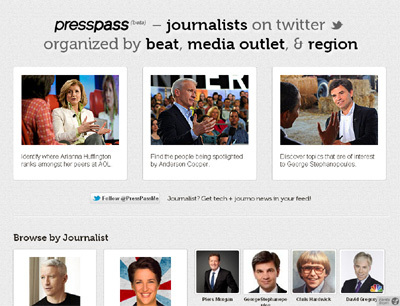 PressPass is an interactive directory of journalists organized by media outlets, beats, & regions aimed at making it easier for small businesses, non-profits, start-ups and citizen reporters to get their news-worthy stories out to the right reporters. Small businesses, startups, non-profits, and people looking to get featured in the news spend a lot more time than they need to in order to find the right journalists for their newsworthy stories. PressPass tracks what the journalists are sharing online, what they’re reading, where they rank in comparison to their peers, the topics they care about and who’s getting their attention, enabling users to get a more in-depth understanding of the reporter.